The land between the preserved fortified medieval city of Carcassone and the Pont Vieux Brige of Beziers was a rough terrain of poverty until about 10 years ago when the world discovered the wonderful wines of this region. With the increased sales of Corbieres, Minervois and Coteaux de Languedoc wines, the rugged “terroir” has now become an endless vineyard of prosperity. The French will always tell you the harder the grapes work in the soil, the better the wine, and these grapes do work hard in this soil. You can’t go more than 400 meters without running into another wine producing/retail outlet, and every one we tasted was delicious; dark in color, rich in bouquet with spicy, fruit forward flavor. And for all of you who hate spending a lot on a good bottle of wine, the most expensive one we found was around 10 €. I figure there won’t be too many more years before the Languedoc wine prices catch up to their Bordeaux neighbors to the west or their Rhone neighbors to the east. We were in the land of the Cathars, which historically equates to one of the greatest genocides caused in the name of Christianity. In short, the Cathars believed that there were two creations, one that embodied all that was good and the other embodied all that was bad. The soul, which was basically good, was trapped in the body which was basically bad and lived in a world that was created by evil. However, if the person followed the path of good, when they died they would eventually be able to enter the world of good, although sometimes it would take a lot of reincarnations to get there. The obliteration on the Cathars did come from an edict from Pope Innocent III, but there was a lot more involved. Land and wealth were at stake here, and to call a crusade against anyone who believed differently from your beliefs was a great way to steal what they had. By the time of the Albigensian Crusade of 1209, knights and soldiers were not only offered wealth and land but also complete absolution of their sins. What a deal. Kill some innocent, peace loving villagers and you get their money, their property, titles and eternal rest in heaven. Gee, times haven’t really changed too much, have they? 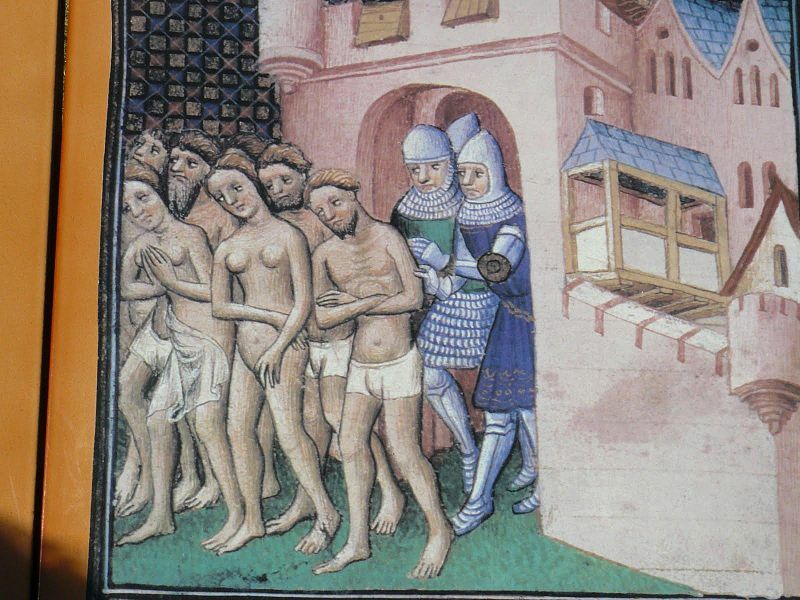 At one point the Abbot of Citeaux ordered 20,000 people of Beziers to be slaughtered just for protecting the Cathars. When someone mentioned that by killing the whole town they might also kill some innocent people, the Abbot said “Kill then all, god will find his own.” 7,000 of them were torched while they took refuge in the town church. 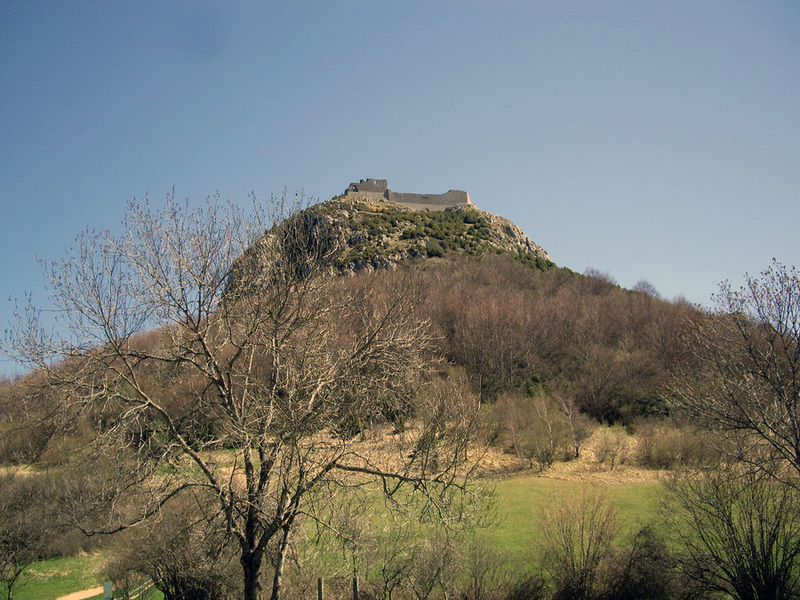 The final chapter of the Cathars ended in Montségur. This was their Alamo. There are a lot of impregnable fortresses built into the limestone peaks of the Languedoc. Montségur was one of them. Around Christmas of 1243, when the fortress was breached, a few of the elders escaped with the treasure of the Cathar church (which has still not been discovered). The Cathars held on for a few more months but by March 2nd 1244, Montségur surrendered. The survivors were given 15 days to make the choice to recant their faith and convert to the accepted form of Christianity or jump into the flaming pyre below the fortress walls. The more than 200 that remained chose the fire. A few years ago, our rental car was broken into in Padirac and Beyrac in the Dordogne, and ever since, I’ve avoided staying in towns that end in “ac”. But our friends Bill and Ineke highly recommended the Bastide de Corbieres in Boutenac. This area of the Languedoc hasn’t really jumped into the international tourist market yet and mostly what you’ll find are the Chambres d’Hote or B&Bs. And so we booked two days at the Bastide de Corbieres and decided to check out B&B living. 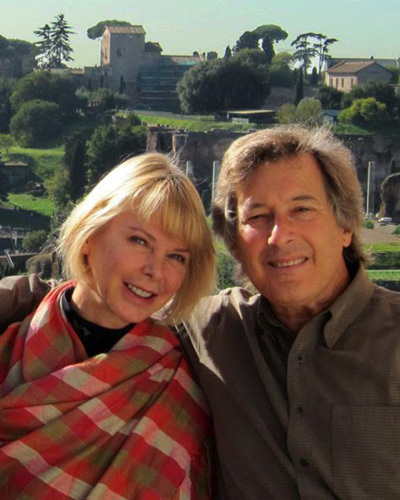 Our hosts, Jacques and Francoise Camel were wonderful. The French, of course, was excellent, but their English was non existant. But that didn’t bother us at all. We’ve been butchering the French language for weeks. I figured if I wanted to make a French person smile, all I had to do was speak to them in their native language. It never failed. Meals at the Bastide were all prepared by Francoise. There was a long, family style table in a large tent behind the main house. Jacques would give us a short history of the wines we would be drinking that night and then Francoise would give us a short history of the dinner. In our two meals there, we dined on soupe de poisson, crabbe en croute, local foie gras, magret de canard, local green beans, salads and pommes frites, chocolate soufflé with vanilla glace, lemon merangue tart and a variety of the red and white wines of Corbiere. Madam Francoise also baked fresh madeleines and apple tarts for breakfast. These people never stopped. It made me realize that running a B&B was much too much work. But for us, it was all a lot of fun, a lot of food and a lot of laughs. We met people from all over France, Belgium and Switzerland, most of them hadn’t uttered an English word since they were in grade school. There were also a few Brits there who had never spoken any French. They just smiled a lot. 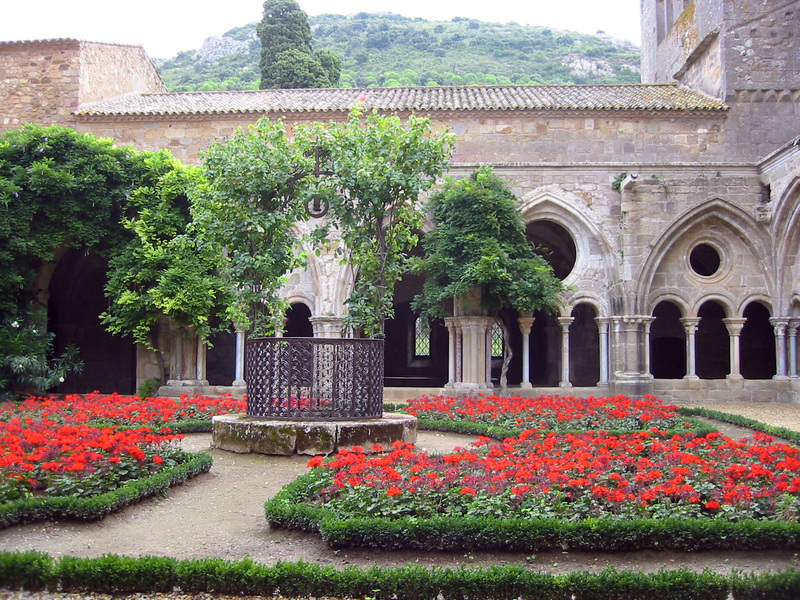 Nearby was the beautiful 11th century Fontfroide Abbey. It’s mostly used as an art gallery these days but the main attraction is the Abbey itself. It’s been lovingly restored and it’s one of the most beautiful examples of 11th century gothis architecture we’ve ever seen. Narbonne is one of the major cities of the Languedoc. 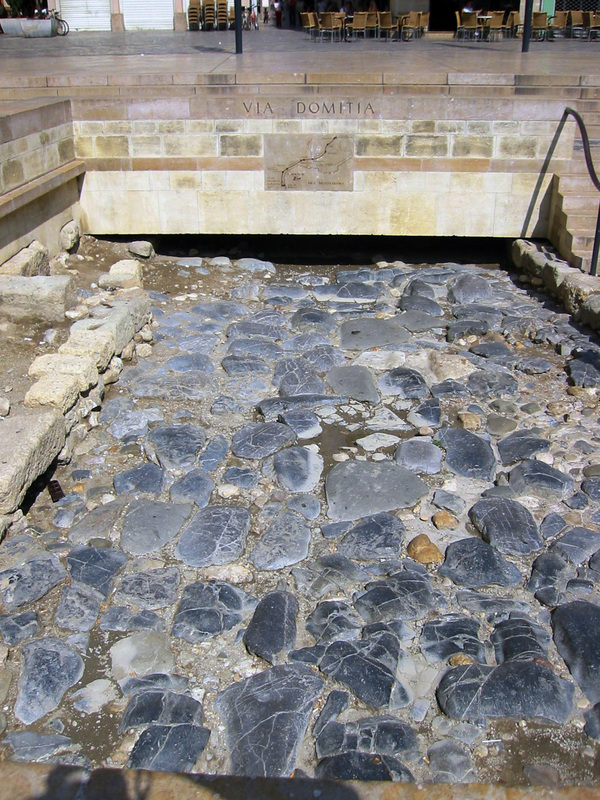 During ancient Roman times it was on the 2nd Century via Domitia, the first Roman road through Gaul that connected Spain to Rome. By the 14th century, the city took a turn for the worse. Between the plagues, the drying up of the Aude River and loss of commerce, things just went downhill. The Grand Cathedral, one of the tallest in France was never even completed. They ran out of funds. In the 17th century, the town was able to connect to the Canal du Midi. Things got better but they never matched their pre 14th century status. Today the river is a little higher and the wine production has brought new life to the old city. Things are looking up again. 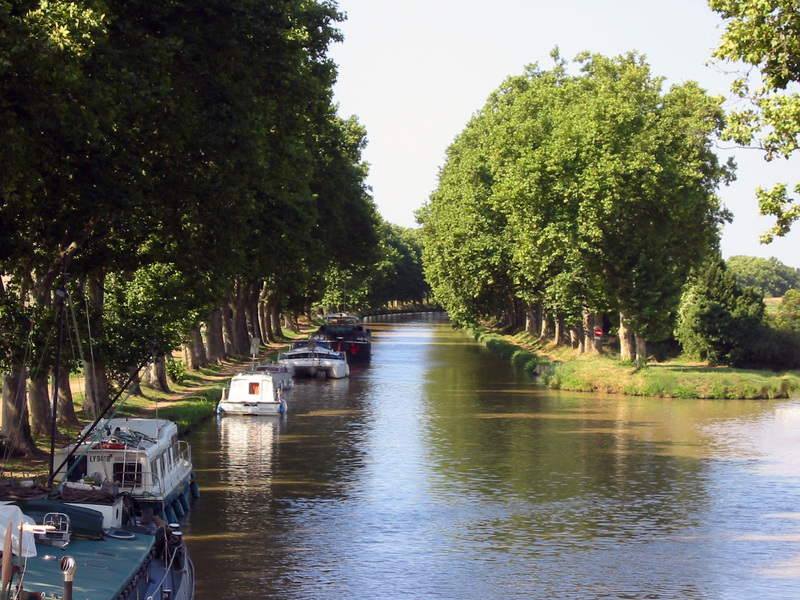 The Canal du Midi is a great story. In the mid 1600’s Paul Riquet, a local land Baron and tax collector convinced Louis XIV’s minister Colbert that it was a great idea to have a 235km canal linking the Mediterranean Sea to the Atlantic ocean. Not only did Riquet sell the idea, he oversaw the project, invented methods of construction and even paid a third of the expense himself. He went so crazy to have this canal, he even sacrificed his daughters dowries to the cause. Riquet died bankrupted, just a few months before the canal opened up. There are lots of beautiful little towns along the canal. This photo was taken in the town of Homps. Some people like to take bicycle tours along the banks, stopping along the way for a meal or a quick coffee. You can rent boats to travel the waterway, however, the allowed speed limit is just a little bit faster than walking. The Languedoc is so much more than I’ve touched upon in this entry. 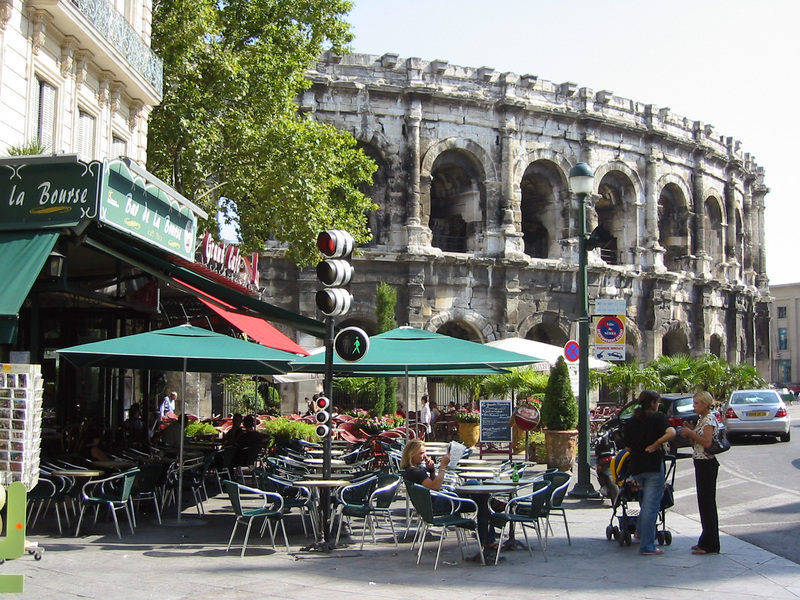 Nimes alone is worth the visit. Inside the city is the best preserved Roman Amphitheater in France. Outside the city is the Pont du Gard, the 161′ tall aqueduct/bridge built by Agrippa in 19BC.